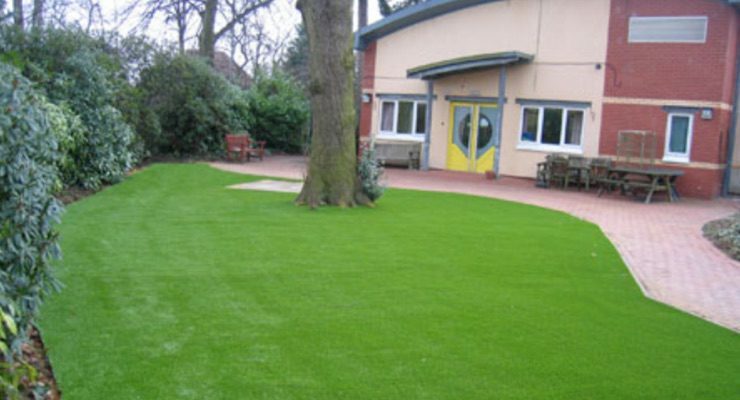 Artificial grass is the perfect solution for outdoor spaces at Primary and Secondary Schools, Nurseries and Play Areas. Synthetic turf provides the opportunity for children to learn and play in a safe, clean, stimulating environment which is hard-wearing and useable all year round. 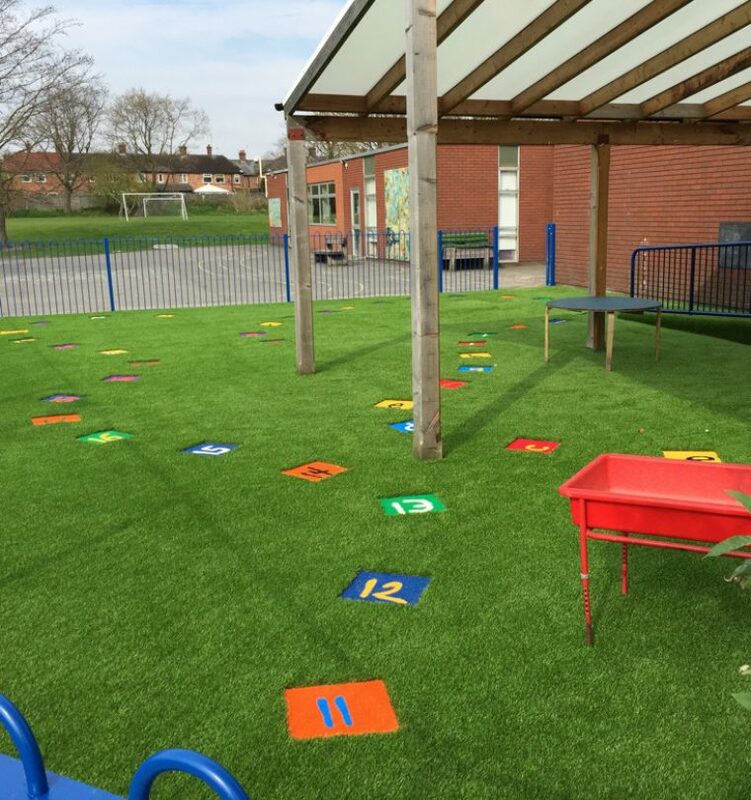 Many of the turfs that we supply are suitable for play areas as they are all safe for children and non-toxic, however, we do recommend our HT Play Grass, Evolution and Schools turfs as being the most appropriate for these areas. The HT Play Grass has also been tested as part of our HT Safe Play System which incorporates our HT Safe Play Shock Pad to create critical fall heights under play equipment. The Play Grass is available in green, blue, yellow, rust, black and white. HT Play Grass Green is priced at £13.50 per m2 and colours at £15.50 per m2 inclusive of VAT. In order to create more interactive spaces we are also able to incorporate shapes, colours, numbers, letters or specific designs into your project. These are manufactured according to your specific requirements and incorporated into your area's design. Prices for these items would be on a per project basis. If it is a multi-sports pitch that you require then our HT Evolution and HT Schools turfs would be ideal due to there tight knit yarn. These turfs are also ideal when covering concrete or tarmac yards. If you would like anymore information regarding the turfs or would like a quotation please do not hesitate to contact us. Whether you need a Multi Use Games Area (MUGA) or a bespoke home putting green our team can provide advice and guidance on the perfect solution for your area. MUGA's have become popular for both Primary and Secondary Schools, Colleges and Universities. The nature of a MUGA enables a range of sports to be played on the surface, this allows for increased use of the area due to it's diverse nature and the area is playable all year round. 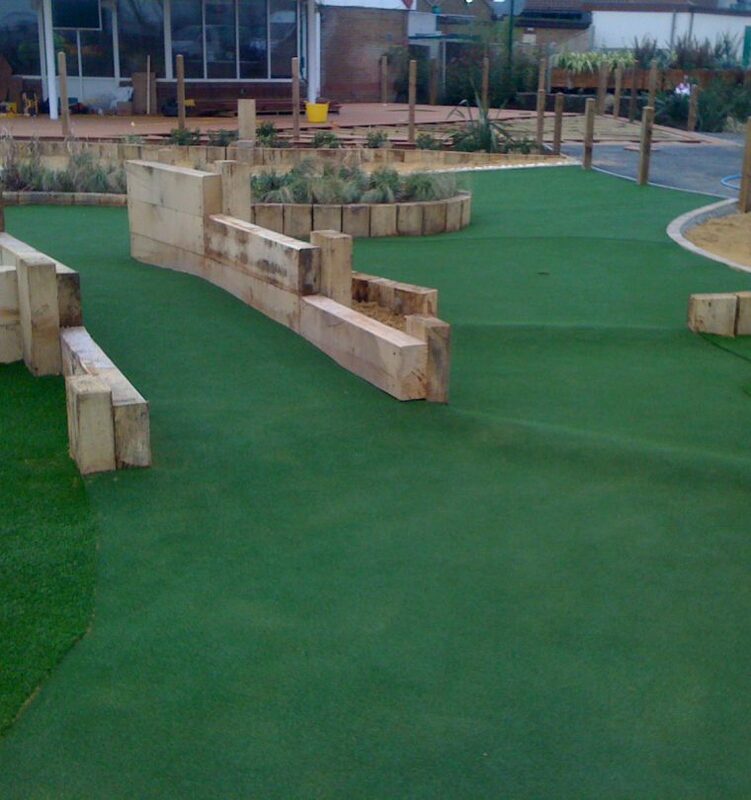 The MUGA surface can also incorporate general play areas that can be used for younger children and outdoor teaching. Incorporating colours, shapes or logos allows for interactive play and teaching. Artificial grass is also the perfect solution for golfers, golf clubs, academies and driving ranges. An artificial grass installation will provide an all weather, all year golfing surface improving practice and playing facilities at golf courses and providing golfers with a practical solution to lower handicaps from home. Compare maintenance of a real and artificial golf green. 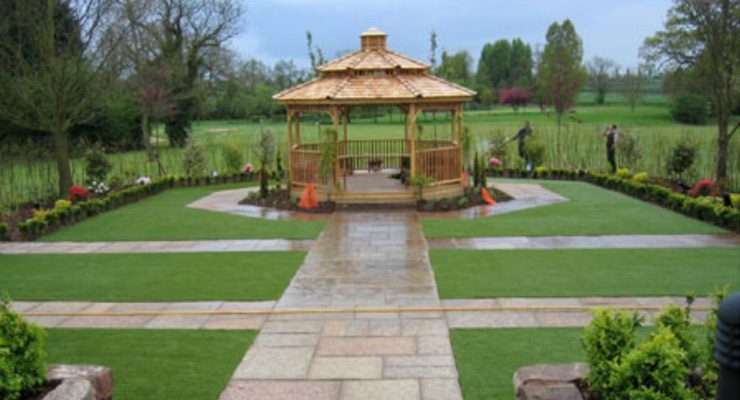 Artificial grass is ideal for putting green installations in your own back garden. Home putting greens are the ideal solution if you want to lower your handicap by practising at home. The costs for creating a natural grass putting green at home can be restrictive when compared to those of an artificial green. Similarly the maintenance Home putting green with synthetic grass involved on a natural grass green can be prohibitive when compared to the minimal maintenance required on an artificial green. Hi-Tech Turf have significant experience of building both natural grass and artificial grass golf greens and tees. This experience is now wholly concentrated on artificial grass so why not contact us today to discuss your requirements. Putting greens are available to buy in several sizes but custom greens can be designed and fitted to your specific requirements. 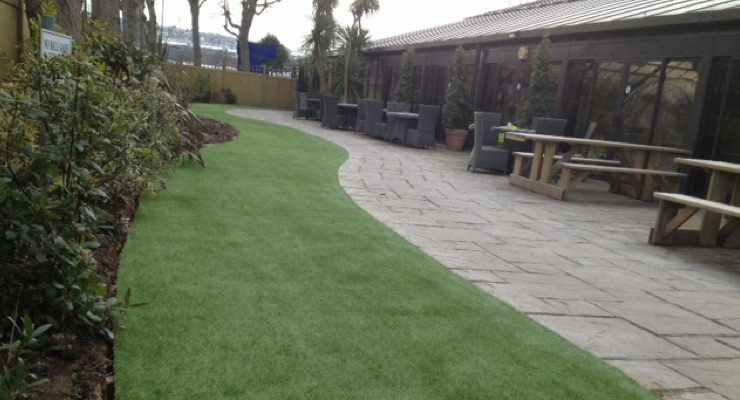 Hi-Tech Turf are able to install artificial grass for all sorts of commercial and corporate events. 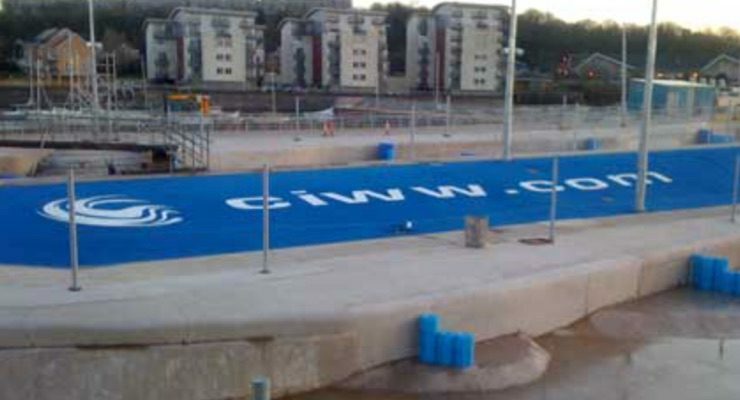 We even have the capability to incorporate your logo or design into the turf. Whether, you need 2m or 1000m, we can cater for all your requirements. Surf Snowdonia is a fresh-water lagoon with a powerful two-metre wave at it's centre, set in the lush green Conwy Valley. Surf Snowdonia is the world's first inland surf lagoon. We installed our HT Lush turf in front of the softwood camping pods at Surf Snowdonia in October 2015. The softwood camping pods provide overnight accommodation for up to four Surfers and thus required a hard-wearing turf to be installed to withstand the high usage of these pods over the season but which also looked as lush and green as possible to fit in with it's beautiful surroundings. We finished 2014 on a high, literally, as we worked on one of our biggest and highest projects. The Tottenham Hotspur FC Northumberland Development Project incorporates a Sainsburys, Tottenham University Technical College and the new THFC club offices. We were tasked by Base Contracts Ltd to turf the various roofs of the building and to incorporate the THFC slogan 'To Dare Is To Do' on one of the roofs, the area housing the slogan alone was 5m x 52.5m. The project incorporated 4301m2 of HT Lush, 340m2 of HT Schools in White and 25mm Shock Pad. We installed our HT Finesse artificial grass within the meeting room at the Space Design and Management office in Lymm. 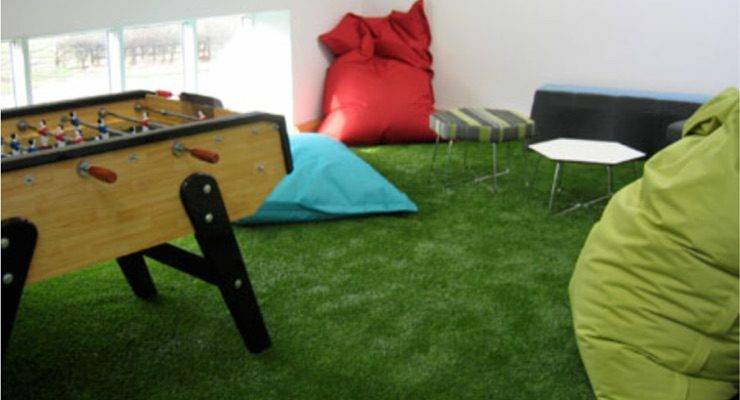 Space will be using the room to show clients the potential of artificial grass within office design. Pryors Hayes Golf Club is set in the stunning Cheshire countryside and provides the perfect wedding venue. We installed artificial turf in the Celebration Garden and Pavilion. Wedding services can be held in the Pavilion in beautiful surroundings. We will be installing a short pile artificial grass at Go Outdoors Stores Nationwide, the areas will be used for tent displays. Talacre Beach Caravan and Leisure Park is a holiday park based on the beautiful North Wales coastline. Holiday homes are available to buy and rent and there are a wide range of indoor and outdoor facilities available. We installed artificial grass on the grounds beside the indoor swimming pool facility. 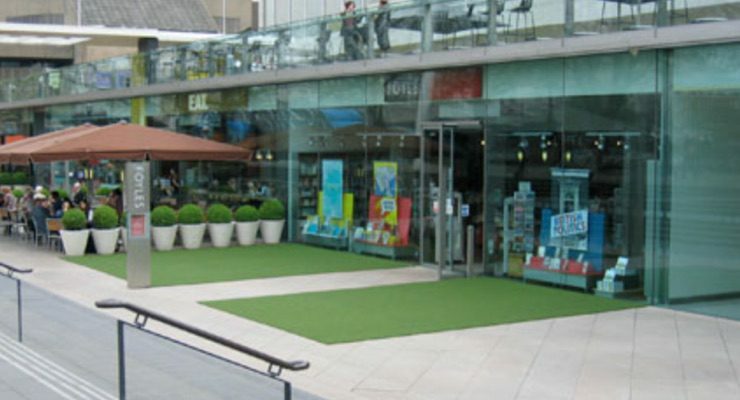 We installed an artificial grass surface outside Foyles Book Shop on the South Bank in London for them utilise during the summer months. At Cherry Tree Hospital in Stockport we transformed an unusable grassed area into a wheelchair friendly surface which all the patients can now enjoy.